The most basic of all sunroom roofs, it is characterized by the roof panels stopping at the top of the exterior walls. Depending on the configuration and the materials used, the straight eave roof style can help make sunrooms look either traditional or contemporary in terms of design. For a simpler sunroom exterior, choose a slanted roof style. It is a single flat roof covering the whole enclosure, starting high against the home’s exterior and then sloping down. The gutters and downspouts are often placed on the side farthest from the main property. This roof style is slanted and has similarities with the straight eave type. The name lends to its vaulted appearance, with one or more flat panels on top of it for dramatic effect. Think of it as a miniature home that somewhat mimics your property. An elegantly curved eave roof makes any sunroom look inviting. Instead of coming to a junction, this type of roof curves over the corners of the room. Its graceful lines and symmetry create an instant fit to the home’s roofline, establishing a more polished look and appeal. Adding a sunroom helps increase your home’s appeal. For this, you need an industry professional to get the job done. 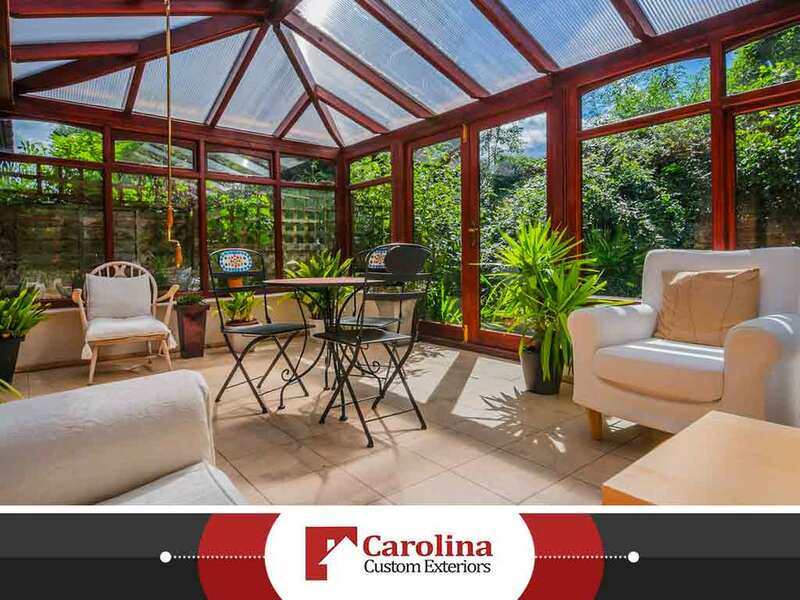 Carolina Custom Exteriors Inc. can make your home an even more enjoyable place to be. Apart from roofing and sunroom additions, we also do deck building and siding installations. Get started by calling (828) 202-9988. You can also fill out our contact form to request a free estimate. We serve residents of Asheville and Hendersonville, NC.